The woman who was seen being sprayed by the Prophet of Doom has gone blind, reports say. 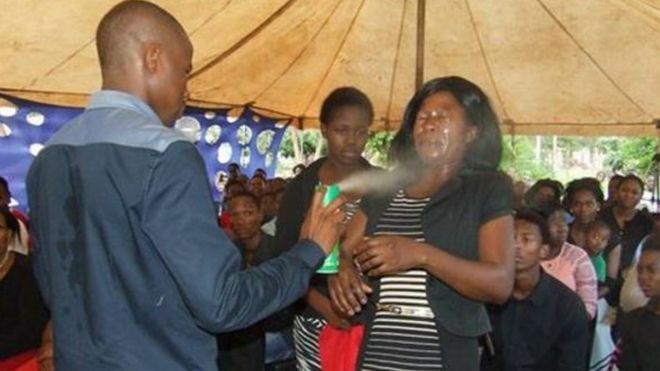 Prophet Lethebo Rabalango from the Mountzion General Assembly in Limpopo, South Africa is allegedly spraying ‘DOOM’ insect killer on his church congregants to heal them. According to close a family member of the woman who was admitted at hospital on Sunday, her cousin started complaining about her eyes being painful on Sunday evening. “We were watching Our Perfect Wedding on Sunday night when they started complaining about their eyes being sore. At first we thought it was something small. We only took it seriously when she told us she was going blind. We washed her eyes with water but it didn’t help. We rushed her to hospital,” said the woman who identified herself as the victim’s cousin. The family also said they would be suing the pastor for R5 million for damages. Prophet Rabalago told eNCA on Monday that he uses Doom insect killer to heal people with cancer, HIV or any other illness. He says that he prays over the insecticide the same way as in the case of the people who use oil or water for blessings.